For the next couple of months, in the runup to the general election here, I'm going to be writing a series of posts about politics in the United Kingdom, from the perspective of an outsider who's by now reasonably familiar with, but still slightly bemused by, the quirks of British democracy. Read them all here. The place you have to start, coming from Australia, is the voting system. The lower house of the British Parliament - the House of Commons - is elected using first-past-the-post voting, rather than instant-runoff voting as used in the Australian House of Representatives. There are no preferences: you mark your first choice, and whichever candidate is the first choice of the most voters wins election. In 2011 there was a referendum on whether to switch from FPTP to an optional-preferential version of instant-runoff voting, here called the "Alternative Vote". FPTP was endorsed by 67% of people who voted. To me, and I think to most people who've grown up in the Australian system, this seems like transparent madness. It doesn't seem right that an electorate in which 65% of people are rock-solid left wing voters and hate the Conservative Party should have a Conservative MP because that strong majority is split between different left-wing candidates. What you see in this chart is the simple story of the rise of the Greens. 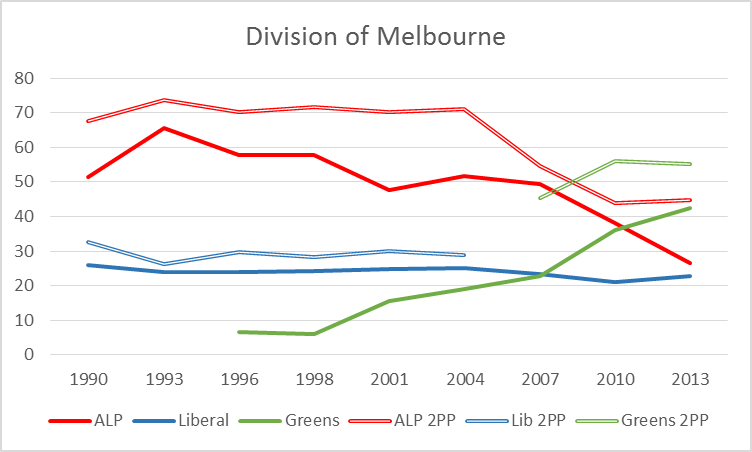 In inner-city seats like Melbourne, growing numbers of ALP voters defected to the Greens. Eventually enough did so that the Greens became the 'opposition' in this seat, the second candidate in the final two: here, that happens in 2007. As soon as that happens, a large chunk of the steady 23-4% of the vote that goes to the Liberal Party flows on to the Greens, and they become competitive for the seat, winning it in 2010 and 2013. It's very difficult for this kind of thing to happen in the UK. One of the things that enables it to happen is that even as more and more ALP voters switch to the Greens, the Liberal Party doesn't come any closer to winning the seat. Right through to 2004, in every election where the final two candidates are Labor and Liberal, the ALP wins with 65-70% of the vote. Defection is safe. In Britain, voting for the Greens would be doing two things: first, it would be wasting your vote, since the Greens have no chance of winning the seat, and second, it would be not voting for Labour, and so actively making it more likely that the Conservatives will win the seat. So people who prefer the Greens vote tactically to safeguard the seat, and the kind of gradual-but-safe change the Australian Greens benefited from doesn't come. Maybe discouraging small parties isn't all bad, if it means fewer coalitions and more stable single-party government. But FPTP also changes the way parties campaign. 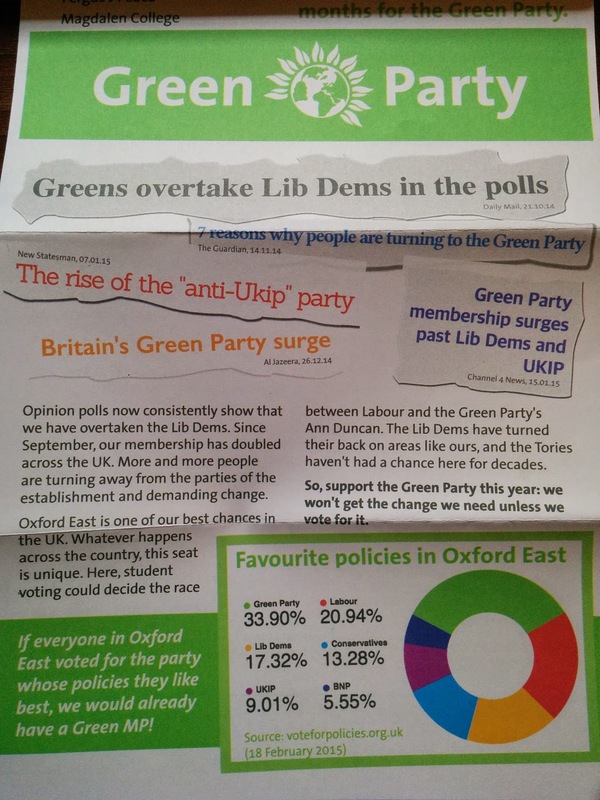 Here's a leaflet I got from the Greens in Oxford yesterday. The Liberal Democrats, similarly, have become infamous for misrepresenting data to make it seem like they are the only party with a chance of keeping Labour, or the Tories, depending on the seat, out of Parliament. FPTP forces parties to make one of the big issues of their campaign the question of whether they have a chance, who's really in contention, and to present deceptive estimates of their strength to draw voters to their fold - none of which has much to do with whose leaders or policies are best. That's interesting to watch, but it's a pretty perverse way to run your democracy.